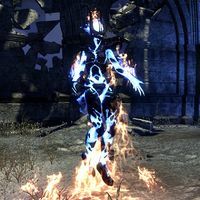 The Planar Inhibitor is a cold-flame atronach found in the White-Gold Tower. It serves as the dungeon's third boss. They have a chance to drop The Unbroken, a unique item. Unlike most other bosses in this game, the Planar Inhibitor is completely immune to taunts. Instead, she will attack the last person to touch the Inhibitor Pinion in the center of the arena. The fight with the Planar Inhibitor is split into two distinct phases. The boss shoots fireballs at the player who closes the pinion doing minor flame damage. Players can stand near the boss without taking damage. The pinion shoots fireballs at all party members if left open, doing moderate flame damage to all players. Closing the pinion will apply the Heat Stroke effect on the player, doing minor flame damage over time to him or her. This effect stacks as the fight continues, and can add up over time the longer the player holds the pinion. In the blue phase, the damage from Heat Stroke is increased. The Heat Stroke effect is removed from the player when the boss gets stunned later. The boss releases pillars of flame around itself, doing high flame damage as indicated by red circles. A flame burst attack inflicting minor damage that can stack up if used constantly. Sister Terran Arminus casts a spell on a player making their screen grayish, in the process revealing hidden portals around the room. The player must destroy these portals before they spawn enemies. Only the player with Moth Vision can damage the portals, although all players can see them. Destroying all portals before they spawn enemies will net players an achievement. It is advised that players with Moth Vision not touch the pinion, as dealing with both the boss and the portals can be overwhelming. As the fight progresses more portals will spawn, and more players will be given Moth Vision simultaneously. After the pinion is closed a few times, the boss dives into the ground, doing high flame damage in an area as indicated by a red circle. After two Magma Diver attacks, the boss surrounds itself with blue flames and attacks the player who closes the pinion. Players near the boss will take high flame damage over time. The attacks from the yellow phase are repeated here, with an extra mechanic introduced. The player who closes the pinion is gradually snared over time, eventually becoming immobile. If the boss comes near that player, it will do very high flame damage to that player, almost always an instant kill. Other party members must close the pinion to distract the boss before it reaches its target. After the pinion is closed a few times, the boss falls to the ground for a moment. All stacks of Heat Stroke are removed, and the party should take this chance to deal as much damage to the boss as possible. When the boss recovers, the Normal Phase starts again, and the fight repeats. Terran Arminus: "This won't end well for you, Your Majesty! Leave the Scroll! Stop this!" Clivia Tharn: "You underestimate me, wretch!" "I will burn your very souls!" "Come! Face darkness and flame!" "How much can you endure?" "Let the heat take you!" "Your will- against my flame!" "My flames will consume you!" "There are flames enough for all!" "Become one with the fire of Coldharbour!" "Succumb to flame and shadow!" "Test your flesh against my flame!" "Nothing will remain of you!" "White-Gold belongs to Molag Bal. All Towers will follow"
"White-Gold has fallen. Existence itself will follow." "You, and all of mortalkind will be forgotten." Terran Arminus:"There! Attack the rifts, she calls her allies!" Terran Arminus:"My spell has revealed the rifts! Destroy them!" Terran Arminus:"She's calling for help! Attack the rifts!" There are a few achievements associated with this boss. White-Gold Tower Vanquisher 10 Defeat the Adjudicator, the Elite Guard, the Planar Inhibitor, and Molag Kena in White-Gold Tower. This page was last modified on 10 March 2019, at 17:54.